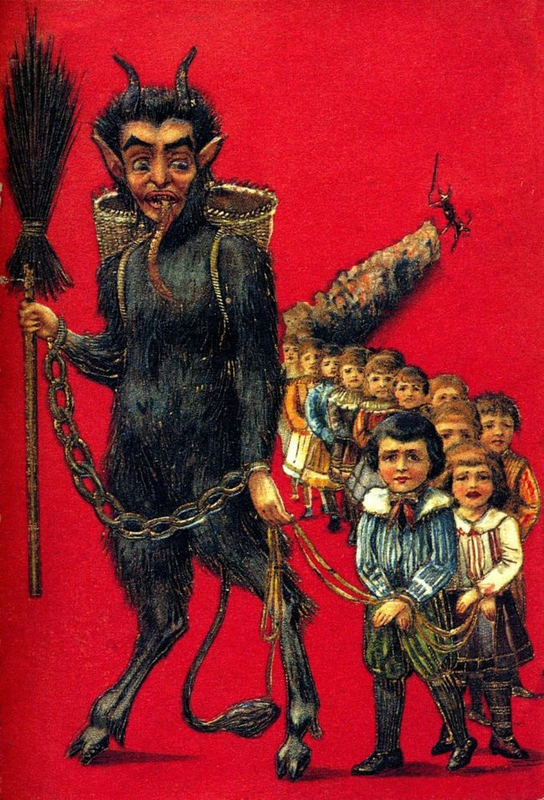 In German-speaking Alpine folklore, Krampus is a horned, beastly figure who punishes children during the Christmas season who have misbehaved, in contrast with Saint Nicholas, who rewards well-behaved ones with gifts. 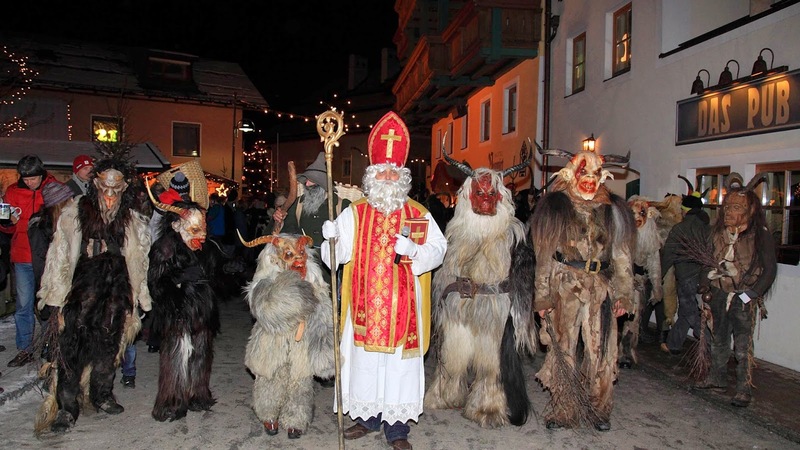 Regions in Austria feature similar figures and, more widely, Krampus is one of a number of Companions of Saint Nicholas in regions of Europe. The origin of the figure is unclear; some folklorists and anthropologists have postulated a pre-Christian origin for the figure. Traditional parades in which young men dress as Krampus, such as the Krampuslauf (English: Krampus run), occur annually in most Alpine towns. Krampus is featured on holiday greeting cards called Krampuskarten. There seems to be little doubt as to his true identity for, in no other form is the full regalia of the Horned God of the Witches so well preserved. The birch—apart from its phallic significance—may have a connection with the initiation rites of certain witch-covens; rites which entailed binding and scourging as a form of mock-death. 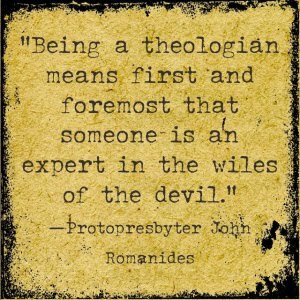 The chains could have been introduced in a Christian attempt to 'bind the Devil' but again they could be a remnant of pagan initiation rites. The Saint Nicholas festival we are describing incorporates cultural elements widely distributed in Europe, in some cases going back to pre-Christian times. Nicholas himself became popular in Germany around the eleventh century. The feast dedicated to this patron of children is only one winter occasion in which children are the objects of special attention, others being Martinmas, the Feast of the Holy Innocents, and New Year's Day. Masked devils acting boisterously and making nuisances of themselves are known in Germany since at least the sixteenth century while animal masked devils combining dreadful-comic (schauriglustig) antics appeared in Medieval church plays. A large literature, much of it by European folklorists, bears on these subjects. ... Austrians in the community we studied are quite aware of "heathen" elements being blended with Christian elements in the Saint Nicholas customs and in other traditional winter ceremonies. They believe Krampus derives from a pagan supernatural who was assimilated to the Christian devil. The Krampus figures persisted, and by the 17th century Krampus had been incorporated into Christian winter celebrations by pairing Krampus with St. Nicholas. Countries of the former Habsburg empire have largely borrowed the tradition of Krampus accompanying St. Nicholas on 5 December from Austria. The feast of St. Nicholas is on 6 December. Check out the video below of 6 facts you might not know about Krampus. Enjoy!